Several club members are working on an initiative to build a long range, self-building, self-healing, backup Wifi IP network infrastructure for our served agencies to use during disasters (and of course for our own use when there isn't a disaster). It uses normal Wifi devices (THIS IS THE RADIO) but licensed under FCC Rules Part 97, so much higher power levels and over much greater distances. 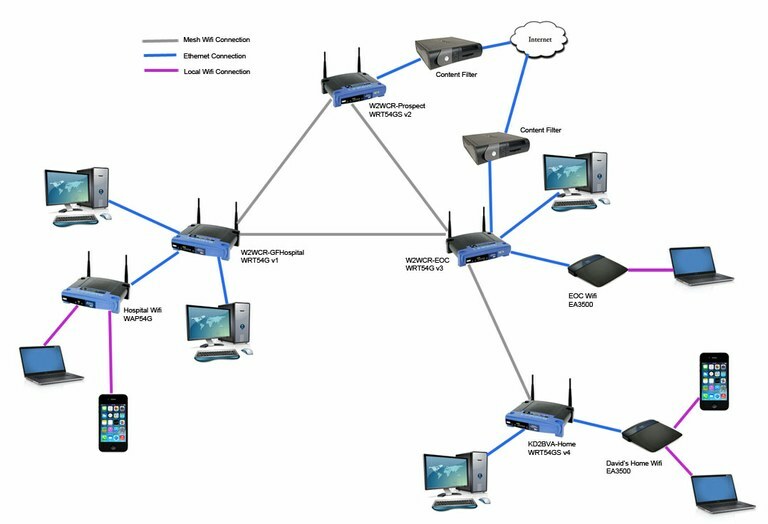 In its current form it is built using the Linksys WRT54G/GL/GS wireless routers and operates on channels 1-6 of the 2.4GHz ISM band, which overlaps with the upper portion of the 13cm amateur radio band. Other platforms and bands are in development at this time. Next will be Ubiquiti equipment with others supported as development resources permit. This will require many mesh nodes, wherever we can get them up high (antenna towers, tops of tall buildings, water towers, etc.) above trees. There will be nodes that act as internet gateways, extenders/forwarders, and enduser access. The following image shows a simple mesh design. Anything that can be done with an IP network or the internet can be done over the mesh, assuming it doesn't violate Part 97 of the FCC Rules. This could also include any other IP devices, wired or Wifi.